My baking journey started years ago, when I could barely reach the table. My grandmother was always making traditional filo, pies, cinnamon cookies and the list could go on and on. I arrived in London in 2009 to pursue a dancing career and I started learning more and more about healthy cooking and gluten free recipes. I started using alternative flours which are healthier alternatives than the ones used in traditional Greek recipes. I didn’t like much what was available in stores and I started experimenting with gluten-free baking. After years of testing and selling in UK markets and speciality delis, I came up with a small selection of products that are both healthy and tasty. Please visit our blog page for ideas and recipes. 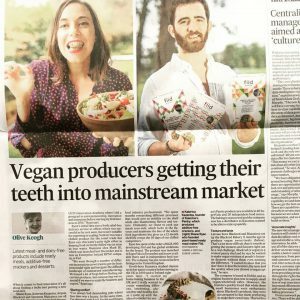 Katerina’s Pantry on Irish Times! You can check the article here! 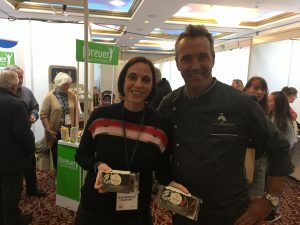 Katerina Kazantza and Chef Kevin Dundon. Kevin has recently used our versatile crackers to create unique canapes for the an exclusive event at Pearse Lyons Distillery!